Whenever someone asks what my favorite city in the world is, my answer is always, Paris. Of course, I love the city I live in because it’s where my family is, and I love the city where I was born and miss it a lot, but I must admit to a decades-long attachment to Paris. My first Parisian experience was in the Marais district, fresh out of university, I decided to park my bags at a youth hostel on a sweet little cobblestone street. I loved this quiet little street, the gorgeous church, and the doggie that hung out at the restaurant on the corner. I soon discovered that Paris was everything I had expected, and more. My closest Metro stop was Pont Marie, the name of which became part of my first ever email address. I loved how the simplest buildings could be so gorgeous, the beautiful architectural details not reserved for museums or city halls, but instead part and parcel of the style of the city. In Paris, you can start your day – every day! – with a pastry, you know why? Because then you walk everywhere for the rest of the day! And how adorable are those window boxes above? You can indulge your addiction to freshly baked bread, too! only to discover that they were filming in Canada at the time. After I returned to the States, they moved back to film in Paris again – MERDE!!! there were posters for Four Weddings and a Funeral, or rather, Quatre mariages et un enterrement, which was the hit movie of that year. but I have to say that it was not the tourist sites that made me love this city. It wasn’t the expensive boutiques or the fancy couture I saw. because seriously, if you could go to a place like that to eat your PB&J, wouldn’t you? And that is why I love Paris. Because of what it is, and because of what it is not. But you know, I decided a few years ago to bring that feeling to my home. I try to cook as much as I can so that I know I am giving my family healthy, nourishing food they can enjoy. I grow my own veggies so that we can eat corn that spent the morning still attached to its stalk. I try to buy things that will last – obviously that doesn’t work for my boys, because they outgrow everything within 3 months – but it means enjoying what we have, instead of always looking around to see what else we can get. It means enjoying life. i can never tire of these beautiful pictures! Pleased to meet you (thanks Anita!) and enjoy your trip to Paris…I’m there too – sadly for one day only!!! Very pleased to meet you as well – I am in Paris only in my mind, but hopefully soon I can go back and start teaching my children to appreciate it, too! absolutely gorgeous!!! i can’t tell you how much i have enjoyed this post. i even read it twice (and that’s just so far, because i know i will again 🙂 and spent a good while too gazing longingly at all the wonderful images. i love that you have taken some of paris into your kitchen, i like to make meals with fresh ingredients too. thank you so much for sharing this truly wonderful post! Awww, thank you, that is very nice to hear, Dorothy! We are lucky to grow lots of things here so I can give my family the best food possible – have a great week! You always remember your first time in Paris, don’t you? You capture the feeling beautifully. Paris, unlike any other city, seduces. It is difficult not to succomb to its alluring ways… but then, why would you want to??? I think it would be impossible for me to ever forget Paris. It is unique and I hope to go back soon! Ahhhh mais oui! So lovely! We share the love for the city. I can’t get enough of Paris. It truly is my home away from home, I want to take my children there and teach them to appreciate it, too! Chere Anita, thank you for your delightful party, what a wonderful way to remind me of all I love about Paris – and see what others have to say – have a great week! How great it must have been to spend time in Paris! What a lovely post. I so enjoyed the photographs of the doors/doorways. Such elegance! 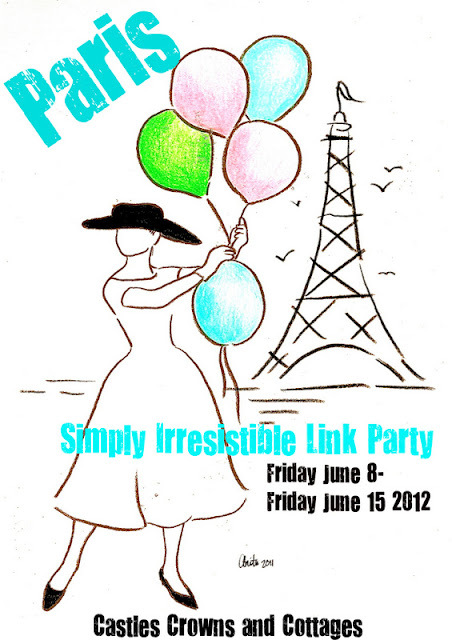 I’m enjoying the Lovely Anita’s Link Party!!! I hope you have a wonderful weekend. Absolutely – I wish we had such doors here at home instead of such cookie cutter homes, but I believe the feeling can be brought in! I appreciate your visit – Paris is always enjoyable, I hope to go back soon! lucky you to LIVE in the CITY that is NOW at the top of my list!! !I LOVE PARIS!!! !Just went for the first time in April..yes, April in Paris!!! !I am smitten and will return sooner then later!!! Thank you, Gina! I am so inspired by Paris, the post practically wrote itself – thank you for visiting! Good morning! I SO enjoyed your Paris post for Anita’s party–what a lovely treat! I loved your philosophy at the end, as well…just perfect. I hope your weekend has been a wonderful one, thank you for your visit and kind comment! I believe we can make the best life possible living anywhere in the world – of course, I’d prefer Paris but I’ll take what I got! To have really lived there,what an enchanting time for you in your life I bet.It has been a pleasure to join you in Paris. It really was a carefree time and I am so glad I chose Paris! 😀 Thank you for visiting! I loved reading of your time in Paris and the images are just beautiful! I am so happy to meet you while touring dear Anita’s Paris link Party. Delighted to have enjoyed your tour and thoughts about Paris! My reasons to love this magnificent city are similar…and I hope you will find inspiration in my Paris picnic, too. Lovely to meet you Sarah – our Paris is enchanting, no? I can’t wait to go back. My husband has been saying something about Italy, but really, Paris should be our first European destination together! I loved visiting your blog, although I have never been to Paris, I have enjoyed lots of little adventures while visiting, Thanks so much for sharing. Hi Linda, thank you for visiting and your sweet comment – I hope you get to visit Paris someday, it will stay with you forever! Anita did throw a wonderful party, didn’t she? Thank you for visiting, Mary!